Lutheran Services Florida Health Systems (LSF), in partnership with Jacksonville University Brooks Rehabilitation College of Healthcare Sciences, has been awarded a Health Resources and Services Administration (HRSA) grant to implement and evaluate an enhanced Certified Recovery Peer Specialist (CRPS) training program in Duval County. The program will address the Northeast region’s shortage of paraprofessionals with the skills and competencies to work with children, adolescents, and transitional-age youth at risk for behavioral health disorders. The CRPS program at Jacksonville University will train 60 students who will commit to a specific field and job placement working with the target population. The enhanced CRPS training will provide a new track for students and community members interested in gaining the advocacy, mentoring and recovery support skills to effectively work with youth and families at risk of mental illness, substance abuse or suicide. There are four different class options and the first class runs Jan. 9- April 28. Registration must be completed by Dec. 16. Click here to register now. 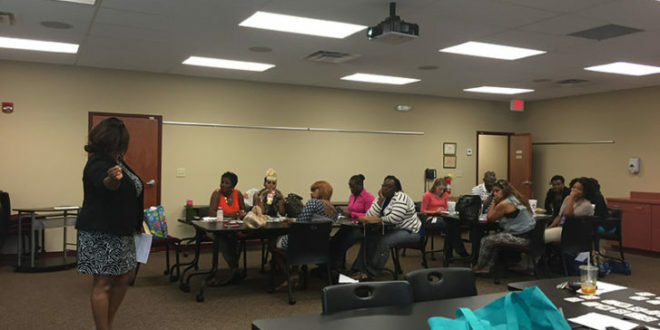 “We are excited about our partnership with LSF and the potential of this enhanced CRPS program reaching out to train our university and community populations who in turn will make a significant contribution to mental wellness in our community,” said Sharon T. Wilburn, PhD, Program Director of Clinical Mental Health Counseling at Jacksonville University. The CRPS designation demonstrates competency in the field of peer-to-peer recovery support, enhances students’ marketability, and introduces paraprofessionals to a recovery-oriented and multicultural perspective on behavioral health care for children, adolescents, and transitional-age youth. In addition to the 40-hour CRPS designation, students will receive training in Youth Mental Health First Aid (YMHFA), trauma informed care, One Love’s Escalation Workshop on Relationship Abuse Prevention, and multi-cultural competency. Traditionally, peer support programs provide an opportunity for consumers who have achieved significant recovery to assist others in their recovery journeys. Peer support services have been shown to: reduce symptoms and hospitalizations; increase social support and participation in the community; decrease lengths of hospital stays and cost of services; improve well-being, self-esteem and social functioning; and encourage more thorough and longer-lasting recoveries. Class 1 (Mon. and Fri.) Jan. 9-April 28, 6-8 p.m.
Class 2 (Mon. and Fri.) March 27-June 16, 6-8 p.m.
Class 3 (Mon. and Fri.) May 15-Aug. 28, 3-5 p.m.
Class 4 (Mon. and Fri.) May 15-Aug. 28, 6-8 p.m.